My friends and I had dinner here afew days ago. It’s a small restaurant in Baldwin Village. The interior is very bright, airy and rustic. We were lucky to get a table immediately at 8pm. I got the winter seasonal special: tan tan noodles ($9.75+tax & tip). 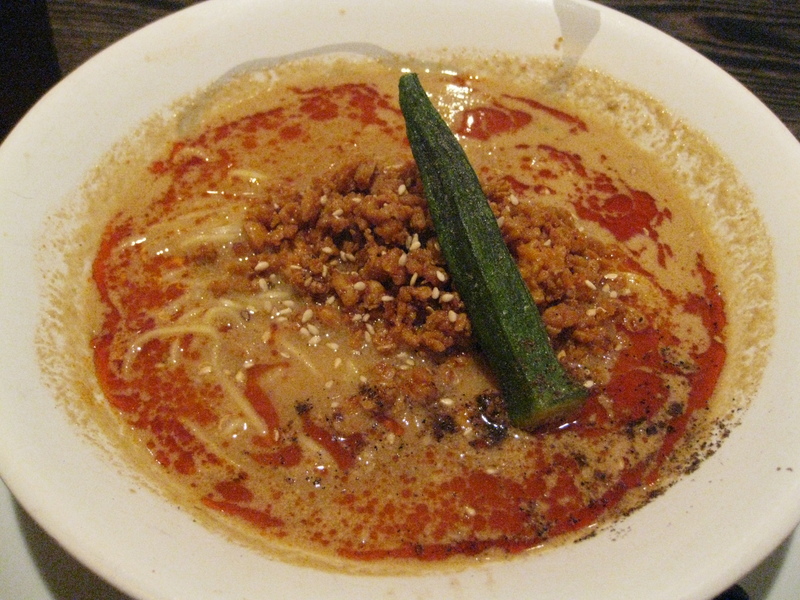 The tan tan noodles consists of a dried okra, sesame seeds, ground chicken, house made chili oil, dried shrimp, miso and ramen noodles. 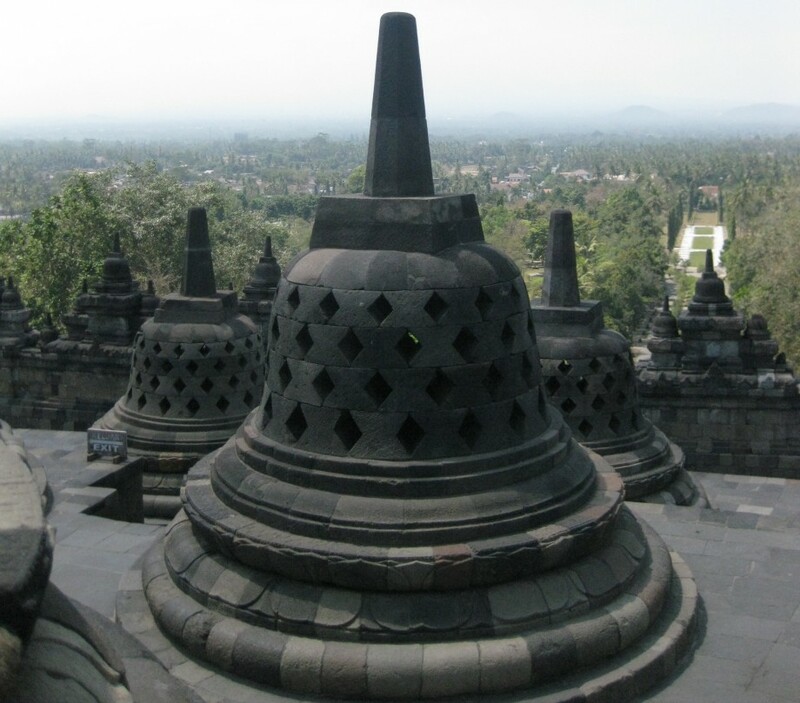 You could choose between regular and spicy for the spiciness level. I asked if I could get 3 peppers since regular was 2 peppers and spicy was 4 peppers and I was fairly sure that regular wouldn’t be spicy enough for me while spicy may be too spicy. I was right in my thinking. The spiciness level for my noodles was just right. Overall, if you’re around Baldwin Village and craving ramen, you should consider Ryu’s Noodle Bar. Another friend and I had dinner here last Saturday. Everything on the food menu is $4.95+tax & tip. We had to line up outside because we arrived around 7pm and in the midst of the dinner rush. It is very dim and loud inside during dinnertime. We split the maple bacon potato skins for the appetizer and the deep-fried apple pie for dessert. My friend got the works burger while I had the Smokey BBQ burger. I noticed that if you order both an appetizer and a main, it arrives simultaneously. If you’re starving and hoping for an appetizer to tide you over until the entrée arrives, you should just skip the appetizer and order the entrée or prepare yourself for the wait. The maple bacon potato skins consisted of russet potato wedges topped with cheddar and mozzarella cheese, crispy maple bacon and green onions with a sour cream dip. It was good, nothing especial about it. The Works burger consists of Alberta beef, maple bacon, cheddar, crispy onions, macho sauce, lettuce and tomato on a toasted Brioche bun. My friend got the Parmesan Caesar salad. My friend enjoyed her burger and salad however it’s not the best burger she’s had. The Smokey BBQ burger consists of beef, smokey bbq sauce, jalapenos, cheddar, macho sauce, lettuce and tomato on a toasted Brioche bun. I chose the Cream of Broccoli soup which was abit salty. The Smokey BBQ burger is not spicy at all and there isn’t even jalapenos in it. The Smokey BBQ sauce tries to be spicy but for a burger that’s advertised as spicy it’s very disappointing. 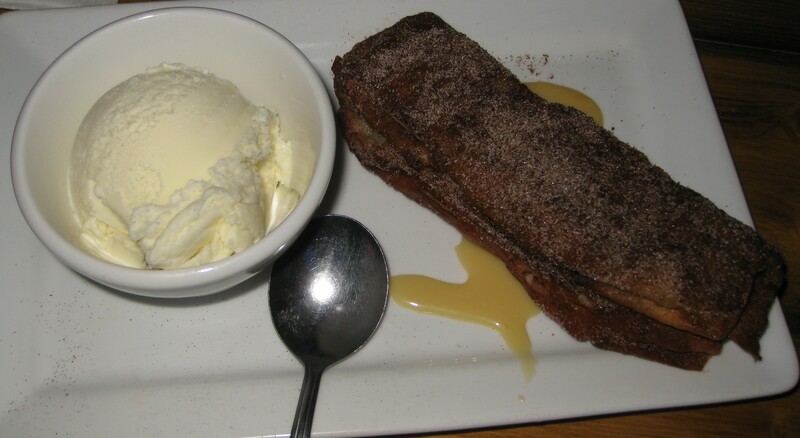 The deep-fried apple pie comes with a scoop of vanilla ice cream in a ramekin and dusted with cinnamon. It’s delicious. 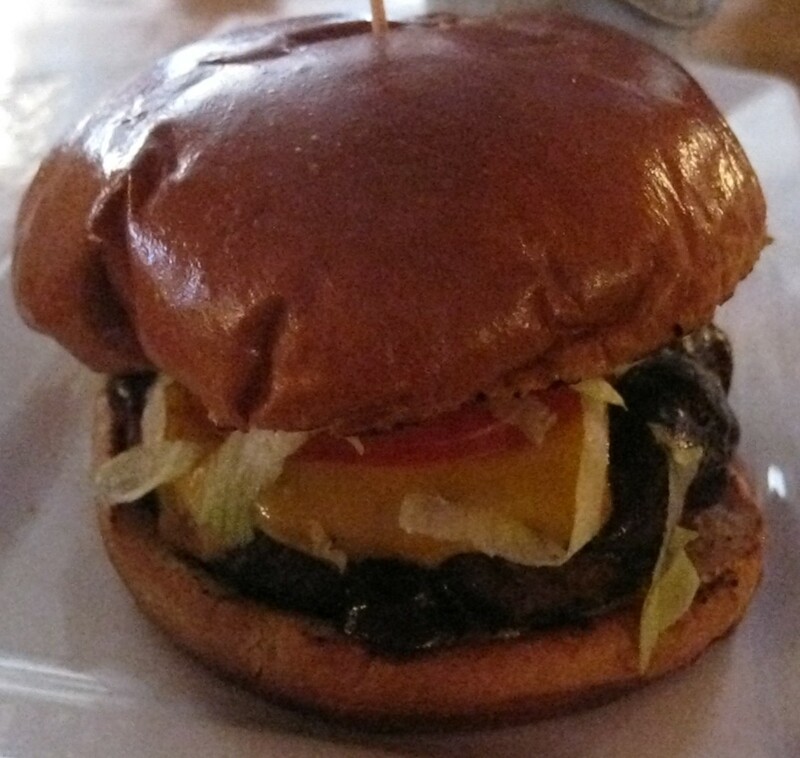 I think I would come back for the deep-fried apple pie otherwise I’d splurge abit more for a burger at W Burger Bar. The appetizers and the mains here aren’t the best. My friend and I decided to have a late dinner at Sabai Sabai. It’s a Thai tapas restaurant on Church near Eaton Center. 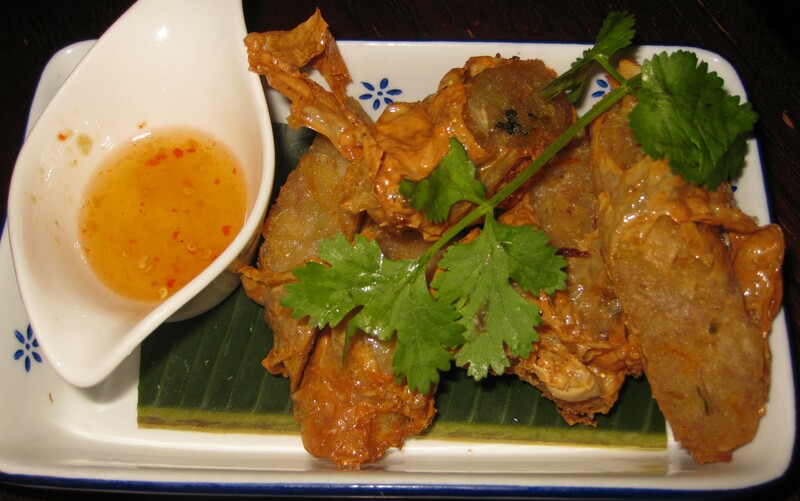 In a sense, Sabai Sabai is a sister restaurant to Khao San Road Restaurant and Sukhothai Restaurant. It’s on the pricier side while the portions are small but not too small. My friend and I got the crispy fried taro roll ($9.5), crispy fried fish ($9) and red flamed stir-fried morning glory ($9). My friend got the Thai Milk Iced Tea ($4) while I got the Sailor’s Delight ($8). The 5 crispy fried taro roll is accompanied by a sweet and sour chili dip and garnished with a cilantro. It’s quite filling since the roll is basically stuffed to the brim with taro. 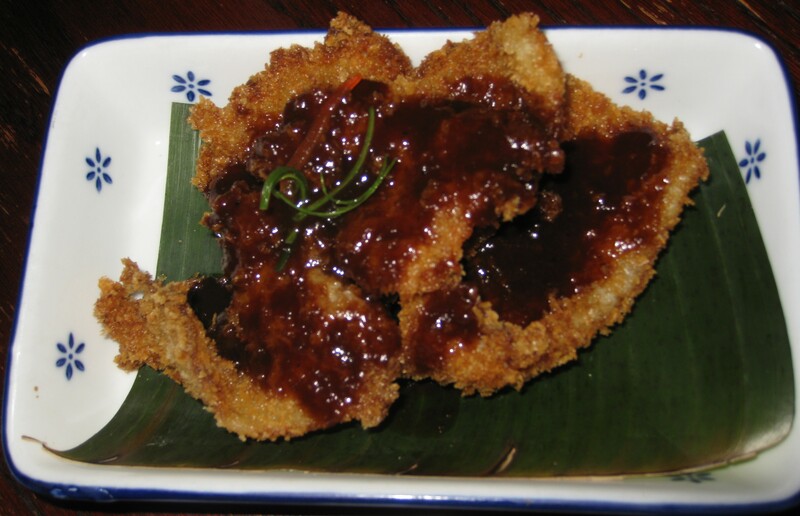 The 4 pieces of crispy fried fish has a sweet and tangy tamarind reduction sauce poured on top of it. It was scrumptious. 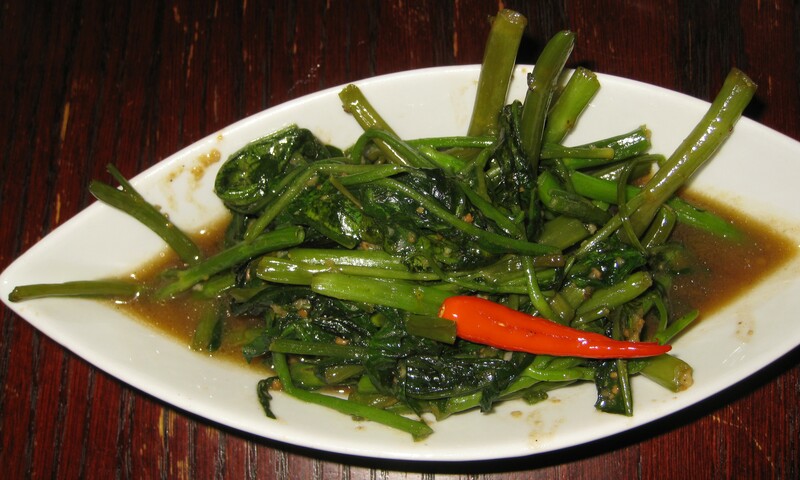 The stir-fried morning glory consists of pak boong also known as water spinach which is also known as on choy at Chinese supermarkets which is stir fried with garlic and chili. It strongly reminded me of the chinese vegetable dishes at Chinese restaurants. Sabai Sabai offers Thai Iced Tea in a milk version and a lemon version. My friend got the milk version and enjoyed it immensely. I was intrigued by their cocktails that incorporated Thai Iced Tea. 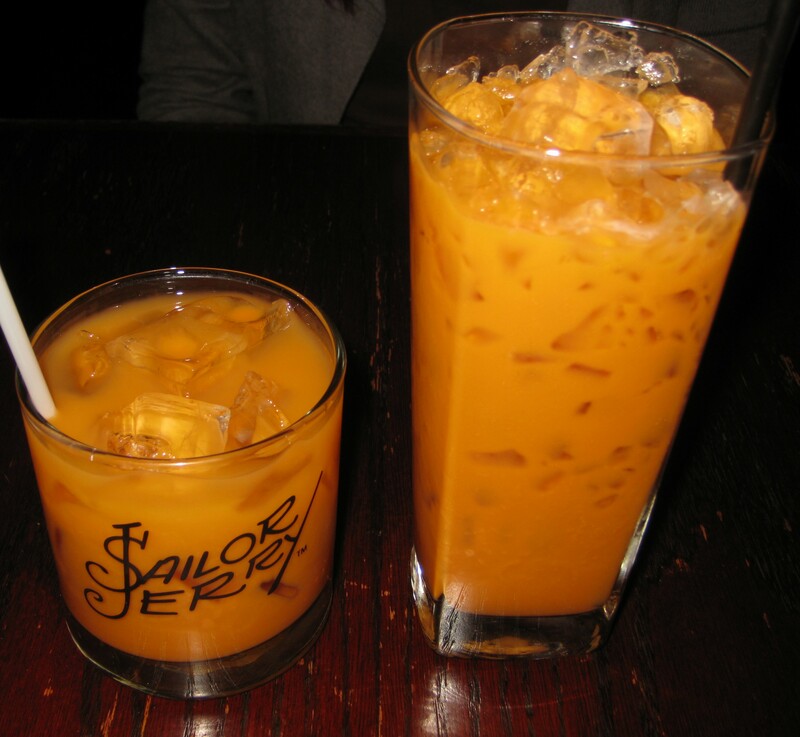 The Sailor’s Delight is comprised of Thai Iced Tea and Sailor Jerry’s Rum. I couldn’t taste the alcohol but I can feel the buzz. The next time I eat here, I want to try the pork skewers (which take 15-20 min. to make fresh), the Thai Long Island and the Thai Iced Lemon Tea. If you want to eat Thai food tapas style then this restaurant is for you. My friend and I decided to eat at Kanto at Market 707 last Saturday. Market 707 is by the Scadding Court Community Center near Dundas West and Bathurst. Market 707 is composed of shops and restaurant kitchens in repurposed bright red-orange shipping containers. There is no specified dining areas aside from the wooden benches around the outside of the community center so eating at Market 707 in the winter can be tricky. My friend and I decided to split the Sisig Fries and Lechon Kawali (total for both is $13.50 including tax). We waited for 20 min. for our food and there was only another order before ours. Keep in mind that there’s only one person doing all the cooking and order taking so ordering and getting your food may take a while if there’s a line up in front of you. 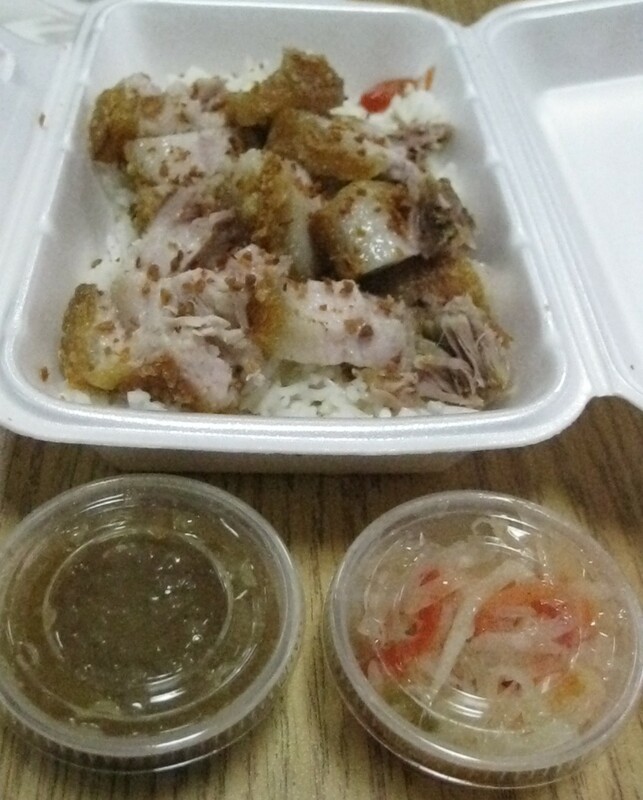 Lechon Kawali is pork belly with garlic fried rice, papaya slaw and lechon sauce on the side. There is the option of adding Srirachi hot sauce if you like it spicy. The pork belly was extremely fatty at times with a tiny bit of meat. The crispy skin was delicious. The garlic fried rice was scrumptious and the papaya slaw is a good accompaniment to the pork belly. My friend and I enjoyed it although it would be better if the pieces of pork belly could be less fatty and have more meat to it. 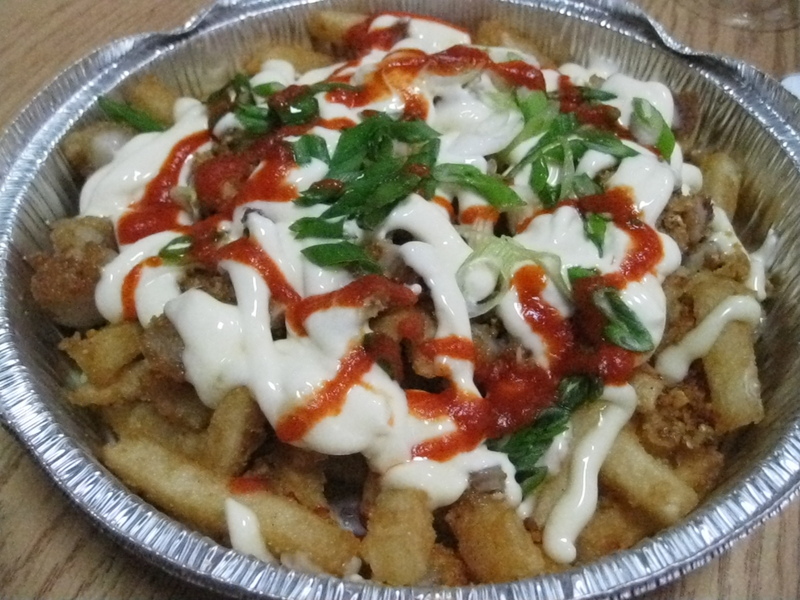 Sisig Fries is a Filipino take on poutine. The Filipino sisig dish acts as the topping on a bed of fries without the gravy or cheesecurds normally associated with poutine. Sisig is comprised of offal meat that is first boiled then grilled and chopped into fine pieces which is then cooked in lemon, vinegar and spices along with pieces of pork belly and drizzled with garlic lemon aioli on top of the meats along with mayo, Srirachi hot sauce and green onions. The fries were nice and crispy. If you’re in the area and craving Filipino food and don’t mind the wait then Kanto is a refreshing option. After eating a taco at 7 Lives, my friend and I decided to get dessert at Millie Creperie which is also located in Kensington Market. 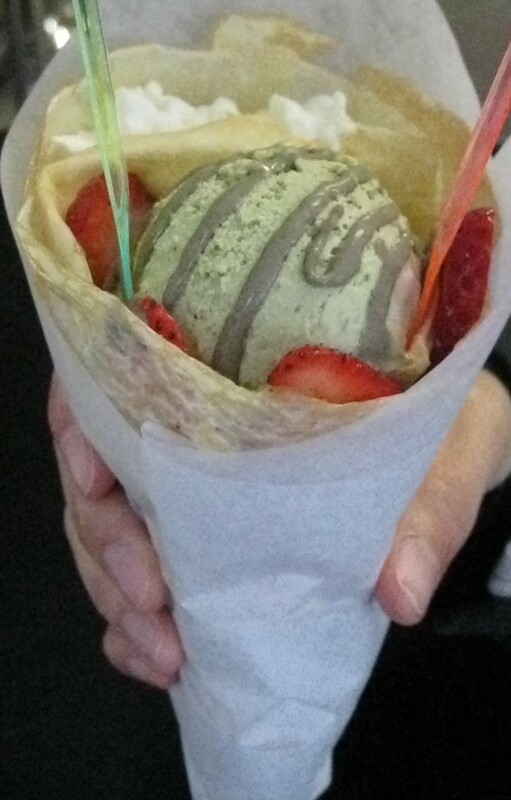 Their specialty is Japanese crepes which are handheld compared to French crepes which are plated. We got the Japanese Special Crepe ($6.75). The Japanese Special Crepe consists of strawberry, red bean paste (azuki), green tea gelato and whipped cream that’s rolled around a crepe. It’s quite good since you can’t go wrong with a strawberry, red bean and green tea combination that’s topped with whipped cream. My friend and I decided to have lunch at 7 Lives last Saturday. It’s a tiny restaurant in Kensington Market with only a table and some standing room. My friend told me that in the warmer months, the line up can stretch around the block. The prices for the tacos are either $4 or $5, taxes included. 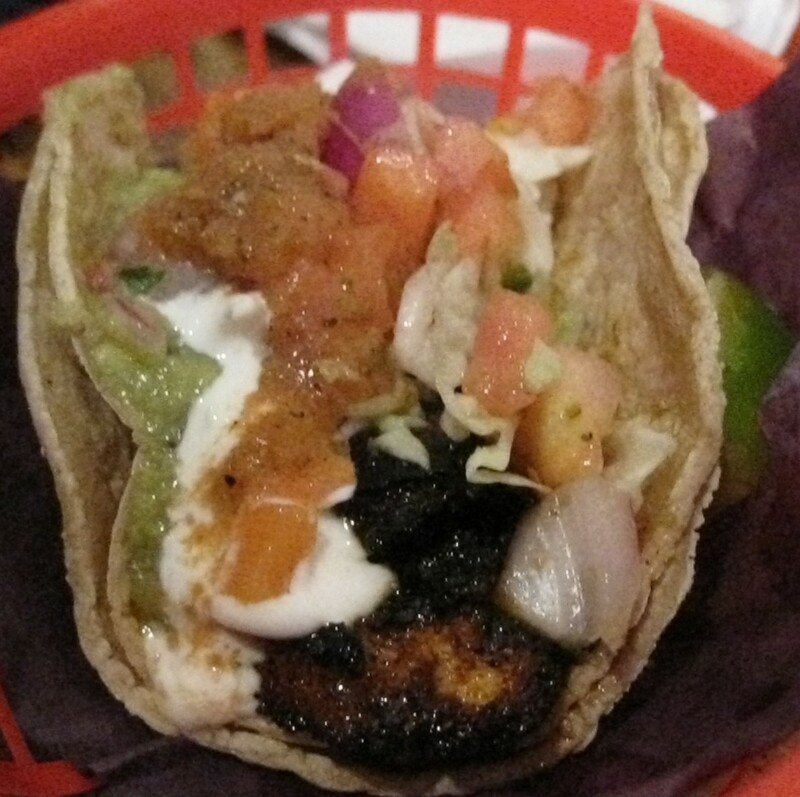 I got the Baja Fish taco ($5) while my friend got the Blackened Mahi Mahi taco ($5). The Baja Fish taco consists of deep fried battered mahi mahi with chopped tomatoes and red onions, cabbage and sour cream on two soft shelled tacos. I put all three proffer salsas on my taco. 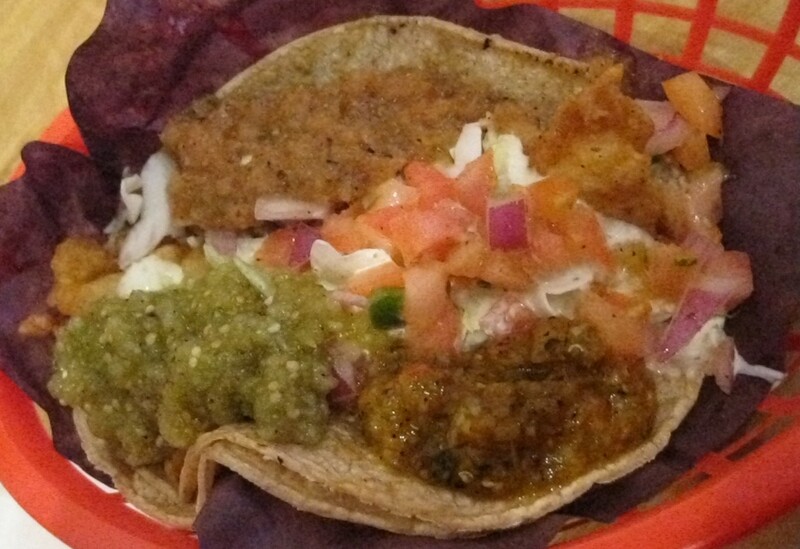 There’s a habanero salsa (very spicy), salsa negra (medium spiciness) and salsa verde (mild spiciness). I had initially thought the habanero salsa wasn’t spicy but the afterkick is very spicy. The salsa negra and salsa verde were quite good. The Blackened Mahi Mahi taco consists of grilled blackened mahi mahi that’s coated with spices before being grilled and is garnished with pico de gallo, sour cream and cabbage on two soft shelled tortillas. My friend enjoyed it immensely. If you like tacos and don’t mind standing and eating then try out 7 Lives. My friends and I decided to eat lunch here 3 weeks ago on Saturday. All the dishes on their menu are less than $5. The decor is very rustic while the lighting is made from welding pipes. The lighting is quite dim even on a very sunny day. My friend got the Smokey BBQ burger while another friend got the roasted turkey sandwich and I got the braised beef dip au jus burger. The Smokey BBQ burger consists of beef, smokey bbq sauce, jalapenos, cheddar cheese, macho sauce, lettuce and tomatoes on a brioche bun with a choice of a side (fries, soup or salad). My friend chose fries. My friend didn’t find the burger spicy and barely tasted the jalapeno peppers. The fries come predusted with black pepper and are quite tasty although the side portion of fries is almost like a sample than a nice portion size for a side. It comes in a mini silver pail reminiscent of the Wild West era and completes the rustic look and vibe at the restaurant. The Braised Beef Dip au Jus consists of beef, horseradish butter, crispy fried onions on a baguette with rosemary au jus on the side and a choice of a side (fries, soup or salad). I got the caramelized onion soup. The caramelized onion soup was good, it reminded me of French onion soup. 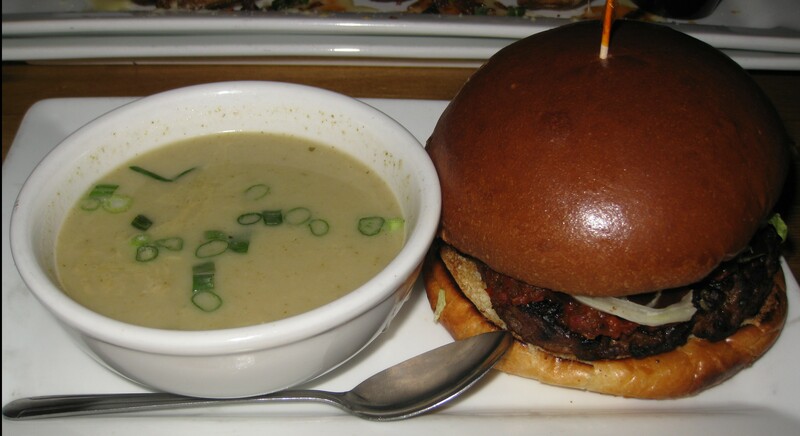 The burger was tasty however I didn’t taste rosemary in the gravy. 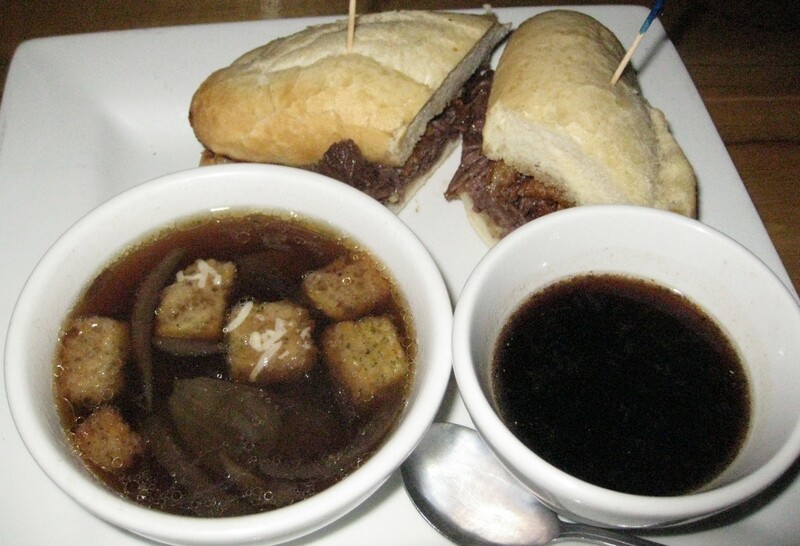 Choosing the soup with the braised beef dip au jus may be abit too watery if you’re looking for a very filling meal. 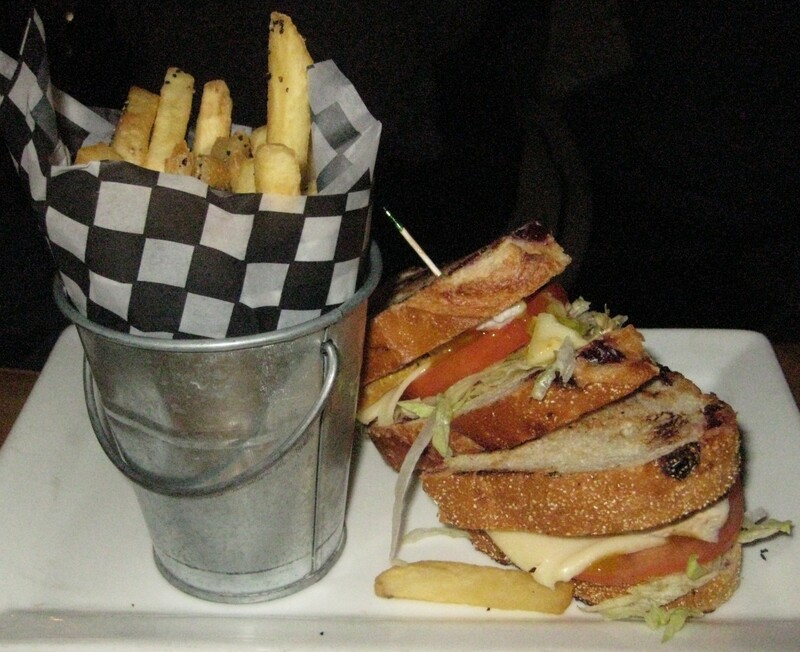 The Roasted Turkey sandwich consists of turkey breast, cheddar cheese, honey mustard, macho sauce, lettuce and tomato on along with a choice of a side (fries, soup or salad). My friend chose fries as well and quite enjoyed the sandwich. Overall, if you’re looking for something affordable close to Koreatown then you should try this restaurant.